Congratulations to the Chamblee School Cluster for executing the 4th annual Healthy Lifestyle Family Fair. Attendance topped over 250 visitors, an increase over last year. Having moved from a 1 school event to an event extended to the bridge the schools and increase community, this year's event brought the community together in a new way. Door prizes totaling over $4000 will be awarded to more than 100 visitors. Nearly every elementary child who put their name in for a door prize won either a kid's lunch at Jason's Deli or a pass to Hippo Hop. The kids really had a great time and when their prizes are delivered next week, the friends who missed it will make note to join next year. Many of the businesses also donated funds to further the wellness initiatives IN the schools. After expenses, each school will receive more than $250. An abundance of activities and resources were provided completely free of charge to school families and neighbors. As you pursue your quest for health, if you visit any of the following, please pass along gratitude for having been a part of our day and for supporting the wellness initiatives in our Chamblee School Cluster. Dekalb Co School Nutrition Dept. Thursday, Nov. 14th is Parent Nutrition Night at Chestnut!! What: Registered dietitian and nutritionist Amanda Wooden will share ways to offer healthy choices when asked, "Can I have a snack?" and "What's for lunch?" FREE! Come taste several low-sugar snack and lunch ideas, and take home your favorite recipes! 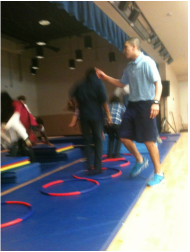 Chamblee Middle School's 2nd annual Healthy Lifestyle Fair on Friday, Nov. 1st was another huge success! The kids spent time with local resources and learning about how to incorporate healthy choices as part of their lifestyle. resources provided an experiential interaction for the kids, solidifying their retention of the information provided. Cross Fit, I9 Sports, Prissy Tomboy, and the YMCA all engaged our kids in physical activities, demonstrating all sorts of ways they can incorporate movement, games, breathing, and fitness into their daily lives. The CDC brought awareness of the seriousness of obesity and how little choices can make big change. Dekalb Co. Library ensured the kids know there are ample resources supporting them to make healthier choices. Arbonne Int'l and Natural Body Brookhaven helped the students to understand that their skin is the largest organ, bringing awareness to the toxins we absorb through it and the dangers we can avoid. The Big Peach Running Company were stuffed by parent volunteers with materials from our participating businesses. Organizational time and energy was provided by OptiMOM Coaching and the Atlanta Natural Health Clinic, the CMS PTSA Wellness Chair, Lisa Engle. Congratulations to the volunteers, all the businesses and organizations that invested in the students last week AND especially to Ms. Jackson, Coach Boston, Coach McKillop and Ms. Huber for making the event possible. Jan. 25th, Chamblee Middle will invite these resources (and more) back for a FAMILY and Chamblee District wide Healthy Lifestyle Fair. INTERNATIONAL WALK TO SCHOOL DAY IS OCTOBER 9, 2013! Students all over Georgia will celebrate the healthy benefits of walking and biking to school. Welcome Back to School! Hi, my name is Nichole Hollis and I am the new School Outreach Coordinator for the Metro Atlanta Region with the Georgia Safe Routes to School (SRTS) Resource Center, and I am excited to provide your school and community with FREE resources, event support and technical assistance to build better SRTS programs. I am excited to announce the 2013-2014 School Year will be a wonderful year for SRTS! We are asking all of our Partner Schools, grades K-8, to register with the SRTS Resource Center, regardless of how active your SRTS program is. For example, your school may be an active Partner that continues to participate, or maybe your school is new to SRTS. Some of you may be new to your school and are not sure how your school has been involved in SRTS in the past and aren't sure what SRTS is. Registering your school with the Georgia SRTS Resource Center lets us know that you want to confirm your commitment to SRTS. Not sure where to start or have some questions? I am happy to sit down with you or someone from your school to discuss the program, explain the benefits to schools, and jump-start your school's SRTS program. For more information or if you would like to sign your school up for International Walk to School Day, please contact Nichole Hollis, School Outreach Coordinator-Metro Atlanta Region at 404.849.4517 or Nichole@SafeRoutesGA.org. Please check out our website at www.saferoutesga.org to sign up and don’t forget to like us on Facebook! Join Children’s for the inaugural Strong4Life Superhero 5K and one-mile fun run Saturday, June 8. Come dressed in your best super hero costume and walk, jog or sprint to the finish line. A costume contest will follow the race and prizes will be awarded to the adult and child with the best superhero gear. This family event at Piedmont Park will benefit the Strong4Life movement, dedicated to reversing the epidemic of childhood obesity and its associated diseases in Georgia. Children’s employees* will receive a $10 discount off their registration fee and $6 off for children 12 and under. Register online or at any Big Peach Running Company store location between April 8 and June 6. My hats are off to Principal Jackson, Coach Boston and Dr. Rice for their support! They are the reason this event is possible. The kids will come to the fair by grade, split into 2 groups, each scheduled at a station. They will rotate through their stations every 7 - 8 minutes. The local support / resources are also split into 2 groups and strategically being located in the gym and surrounding areas for efficient flow of the kids. There is a "scavenger hunt" being created for the kids to be intentional about fact finding while they experience the fair. Set up for the fair participants will begin at 9:00. DCSS Nutrition will be promoting healthy lifestyle choices / nutrition in the cafeteria through the lunch line. There is still potential for a few more folks to be added in, but we'll just add them to an existing station so not to try and edit the schedule further. If you, or someone you know, can commit to a grade time slot, please sign up here. If you have trouble using Sign Up Genius, just let me know you'd like to help. I'm excited to see how this goes. I really believe we can shift our culture, normalizing healthy living.